Although the Asus ROG G751JT-CH71 gaming laptop has been superseded by the G752VS-SX74K, if you're looking for serious performance for PC gaming in a 17-inch laptop, the G751JT does it extremely well thanks to its combination of fast GeForce GTX 970M graphics and an IPS display. The gaming laptop handles heavy computing while remaining incredibly quiet. Its one glaring weakness when it comes to performance is the storage, but many gamers may be willing to overlook this issue due to the cost savings. There are some minor annoyances with the audio and touchpad, but most gamers won't notice them when using external peripherals. This laptop is still readily available. Lack of SSD holds back performance. Audio with subwoofer lacks fidelity. The touchpad has some dead spots. ASUS has been extremely successful when it comes to gaming laptops thanks to the ROG series models. The ROG G751JT modifies previous designs to pack in some extra performance and features. This is a large laptop at 1.7-inches thick, and it weighs in at 8.4 pounds, but many gamers don't mind the size or weight. It features large ports and space behind the screen, which limits the range of the display tilt backward. One thing to note is the new internal subwoofer that is intended to offer improved audio. Overall, the effect is limited when compared to the closed headphones most gamers user. The rear bottom of the laptop has large feet to prop it up for cooling. This is fine for hard surfaces but make it more difficult to use on a soft surface. Processing power has not changed much, with ASUS continuing to use the strong Intel Core i7-4710HQ quad-core processor. There are some slightly faster models available, but they aren't much faster when it comes to PC gaming, which is more reliant on the graphics processor. For most people looking to use it for non-gaming, this processor provides more than enough performance for tasks like desktop video editing, especially when the processor is matched up with 16 GB of DD3 memory, which prevents lag even when multitasking. A nice surprise is how relatively quiet the system operates when it is under heavy loads including gaming. If there is one area that can be improved upon for the ASUS ROG G751JT-CH71, it is the storage. It provides plenty of space thanks to the 1 terabyte hard drive. The problem is that the 7200 rpm spin rate on the system can't compete with the performance of even a small solid state drive. With the price of the system, it is not surprising that it does not have one. Users who want more performance may want to look into adding an SSD drive to the system, particularly an M.2 card for the best speeds. If you need additional storage space, the laptop features four total USB 3.0 ports for use with high-speed external storage drives. It even features a Thunderbolt port which can double as a DisplayPort connector for a monitor or for even faster storage options. The system features a dual-layer DVD burner for playback and recording of CD and DVD media. The system is built for gaming, and that makes the display and graphics critical components of the ROG G751JT system. The display is a standard 17.3-inch panel that uses an average 1920x1080 native resolution common to many laptops these days. Rather than a TN panel, which offers extremely fast response times, it uses IPS technology. This means that it has improved color and viewing angles over other systems. There is an anti-glare coating on the display, which helps prevent glare and reflections, but it mutes the colors a bit. The big feature is the NVIDIA GeForce GTX 970M graphics processor. It easily handles games at the full-panel resolution with high frame rates and detail levels. It can even do dual-screen gaming with an external display. ASUS touts triple-screen gaming, but this would push the limits of the GTX 970M, especially with its just 3 GB of video memory. ASUS has been known for some solid keyboards, and the ROG G571JY uses an isolated layout similar to many that the company has used in the past. There are some slight differences including the layout of the arrow keys and numeric keypad, which can be both useful and distracting depending on which of the two you more likely use. It features a red backlight for use in low light. Overall, it has a good level of comfort and accuracy. The trackpad is a different matter. It is a nice large size, but it has a slightly tapered shape rather than a full rectangle shape. The result is that there are some spots on the pad that don't track as well as they should. Most gamers probably won't care because they tend to use an external gaming mouse anyway. It features dedicated left and right mouse buttons which are better than integrated buttons. The battery pack for the ROG G751JT is a fairly compact 8-cell model with a 6000 mAh rating. This is a bit smaller than some other gaming laptops. In terms of running time, the digital video playback testing yielded roughly three and three-quarters hours. This is typical of a gaming laptop running time. Of course, gaming really taxes the power, and battery life may be less than two hours, so be prepared to plug it in for gaming sessions. 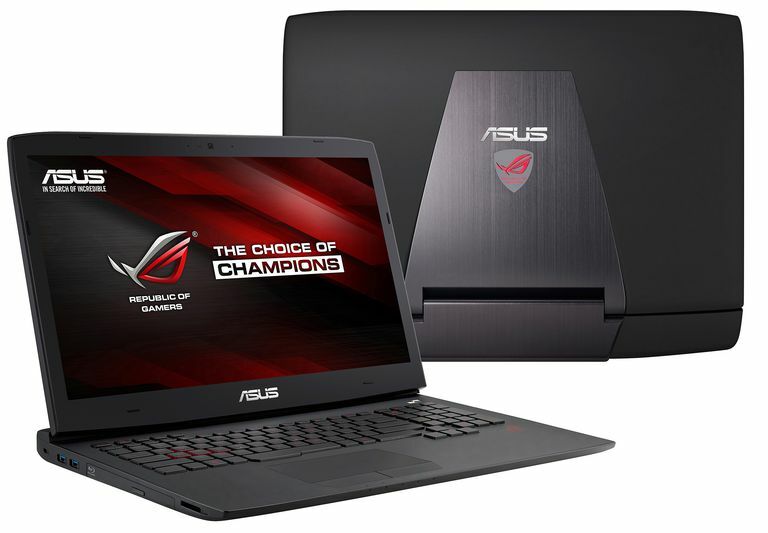 Reasonable pricing is one of the things that made the ASUS ROG laptops popular.